Seeing that today is Halloween I wanted to post a scary or Halloween type photo but alas, I haven't done any pictures like that lately. Clearly I need to spend some time doing some creative shots again. I do have a picture of old grave stones in the historic Scottish Cemetery in St Georges Park though so it will have to do. 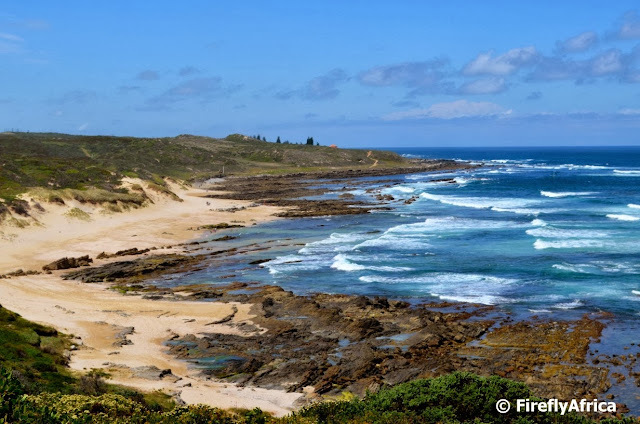 In 1647 the Portuguese galleon Sacramento ran aground between present day Schoenmakerskop and Sardinia Bay with 72 survivors reaching the beach and only nine making it all the way to Delagoa Bay (Maputo) in Mozambique. That is a distance of 1,300 km on foot. The ship carried a shipment of cannons and these spent the next 300 odd years on the ocean floor until they were salvaged in 1977. 40 bronze cannons were brought up and one of those cannons still stand in Schoenies at the start of the Sacramento Trail. As you walk along the trail you pass through Cannon Bay where the Sacramento sank. Hard to think these cannons were right there all those years. 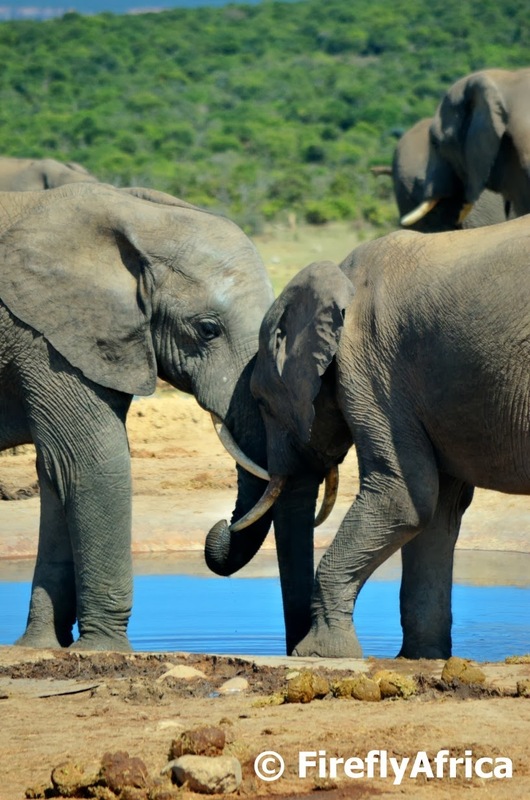 A couple of elephant bulls interacting at Hapoor waterhole in the Addo Elephant National Park. Nothing wrong with a bit of brotherly love or bromance. Most South Africans are familiar with the 1960 Sharpeville massacre where the South African Police opened fire on a protesting crowd, killing 69 people. 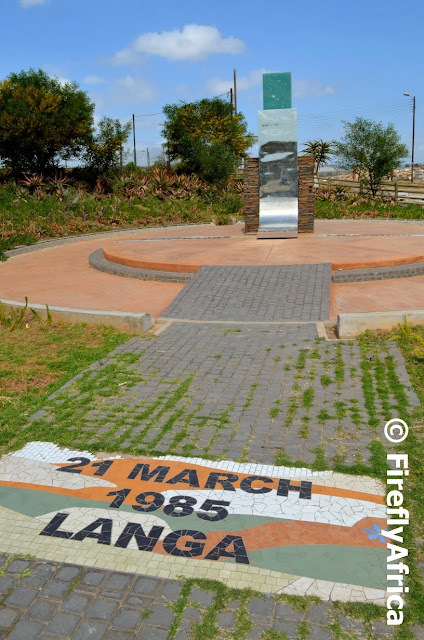 Very few people know though that on the 25th anniversary of Sharpeville, something similar happened in Langa township in Uitenhage when the Police opened fire on a crowd of mourners on their way to a banned funeral. Twenty people were killed in the incident on 21 March 1985 and it became known as the Langa Massacre. 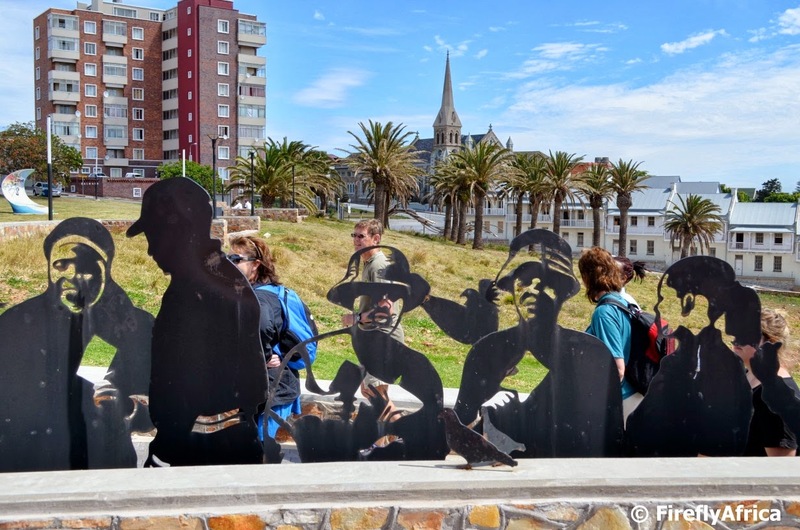 The incident was followed by an international outcry and a Commission of Inquiry (the Kannemeyer Commission) was immediately appointed to investigate the cause of the shooting. This Heroes Monument marks the spot where the tragedy happened. 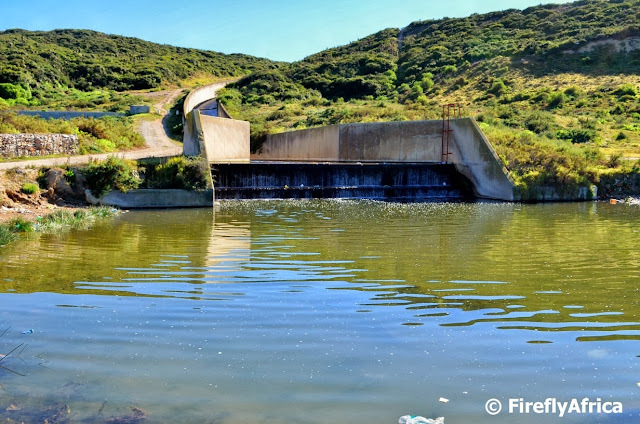 The Swartkops River has huge pollution problems which emanates mainly from polluted water that flows into the system from storms water canals containing raw sewerage and many tons of litter and waste. 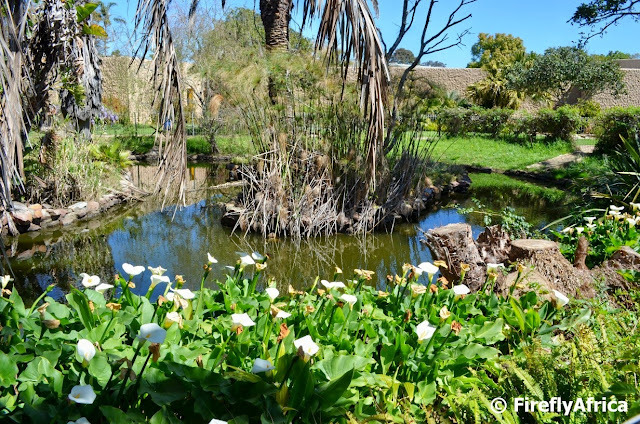 One of these are the Motherwell storm water canal which can be seen close to the start of the Flamingo Trail. 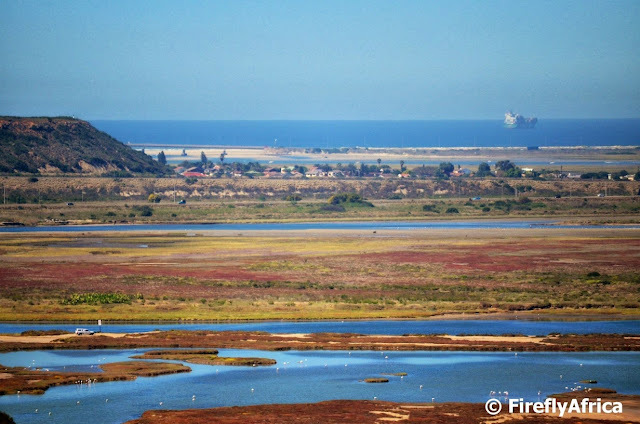 Its truly sad to see such an important wetlands area polluted in this way and although there are plans in place to counter it, there are a lot more budget that needs to be allocated by the municipality to successfully fight this problem. 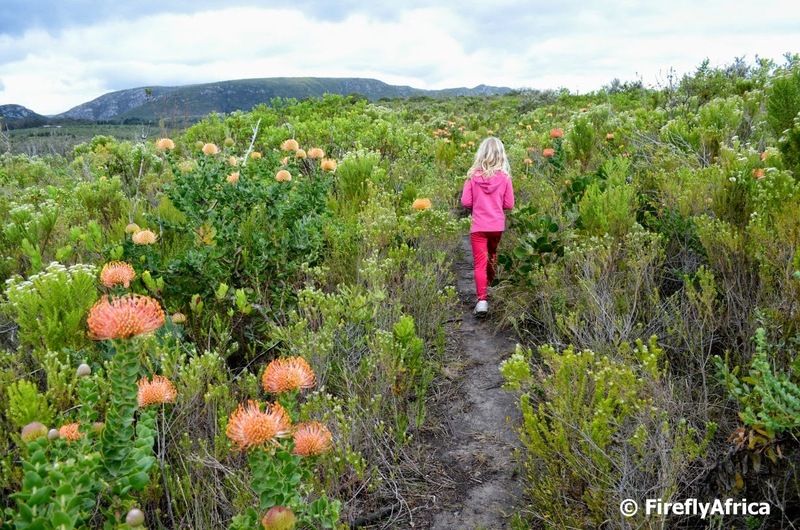 The Van Stadens Wildflower Reserve is looking stunning at the moment with loads of Pin Cushions and King Proteas in flower. We went for a short walk through the reserve and eventually Drama Princess and I fell so far behind the Damselfly and Chaos Boy cause she kept on stopping to look at flowers and ask questions about them and other things we saw. I didn't mind though because it gives me a good excuse to snap some pictures as well. The path in the picture is the link path between the River Walk and the Forest Walk. 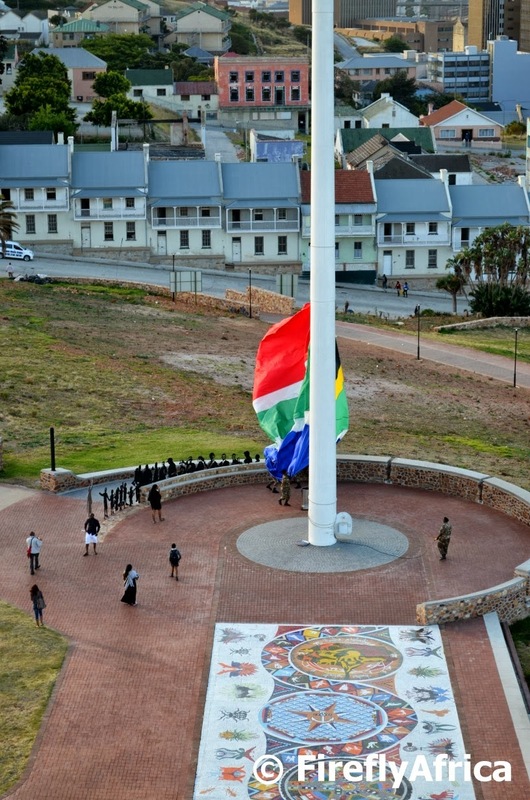 The Great Flag on the Donkin Reserve measures about 10 meters x 15 meters yet while its flying 65 meters up on the second tallest flag pole in Africa it doesn't quite look that size. That is until it gets taken down in the evening by the Prince Alfred Guard and needs six soldiers to catch, control and return to its container. I really can't reiterate how Geocaching is taking me to places where I've never been before and for somebody who has thought I've seen most places there is to see around Port Elizabeth I keep on being surprised. 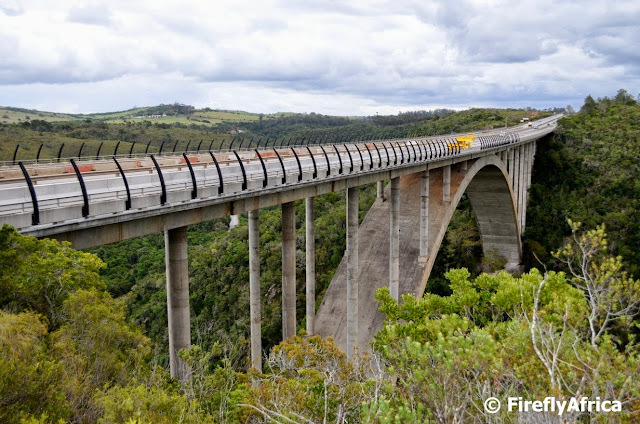 Going after a couple of caches in the Van Stadens Wildflower Reserve I had to follow the path linking the Forest Walk with the River Walk which took me underneath the magnificent arch bridge spanning the gorge. I have driven over it literally hundreds of times but I've never thought that I would ever be able to see it from underneath. I'm sure my friend Craig Duffield from Mosaic Tourism will forgive me for posting this photo, but he did pose for it after all. This is the look of a beer connoisseur when he comes face to face with a tray full of beer tasting samples at the Bridge Street Brewery. The only problem is the size of those glasses. 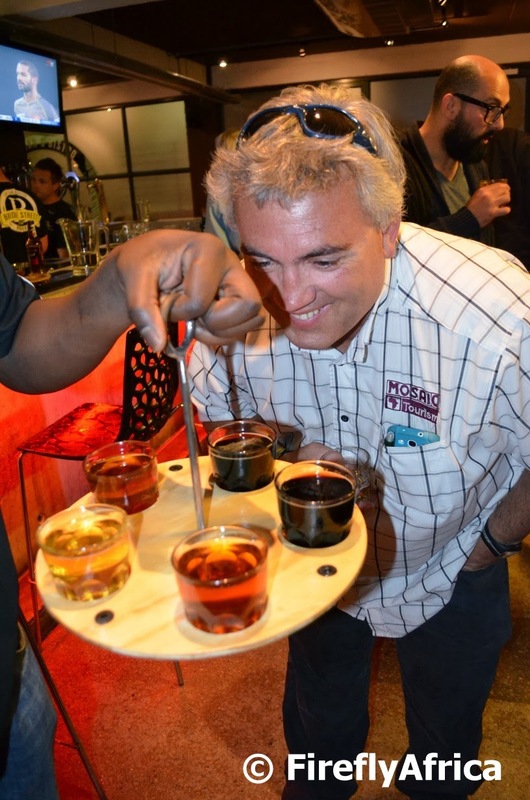 The Bridge Street Brewery in the lower Baakens Valley is Port Elizabeth's only micro brewery with Lex Mitchell (the same Lex Mitchell who started Mitchell's Brewery in Knysna) at the helm of the brewery side of things. The golden coloured beer on the left is their Celtic Cross Premium Pilsener, my absolute favourite beer, while the darker two in the middle are both Boar’s Head Best Bitter, more Craig's taste. The two black ones on the right are Black Dragon Double Chocolate Stout. Now I'm not a stout drinker, but those have got a beautiful, nearly coffee flavoured taste. Bridge Street's fourth beer is their Bowman Natural Cider. We were at Bridge Street Brewery as part of a trade educational to expose the restaurant, bar and brewery to local tour operators and folk in the tourism industry. The Tower Sculpture at the bottom of the Donkin Reserve is one of the more peculiar yet interesting art pieces forming part of Route 67. The piece was designed by The Workplace Architects and acts as a beacon to announce the journey through the Donkin Reserve. It can be found at the start of the winding path and responds to its surrounding elements using the sun and wind to bring it to life. For this picture I stood underneath it looking up. 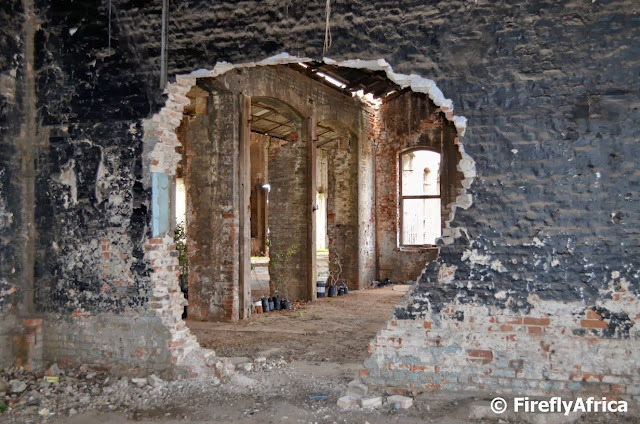 This is a hole in a wall and not THE Hole in the Wall as in the famous one on the Wild Coast. But all holes have to start somewhere in some wall before becoming famous. This one is making its debut in the old railway sheds in Uitenhage. 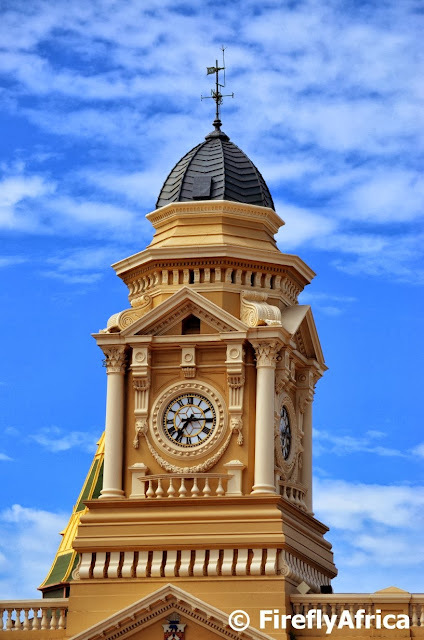 The Port Elizabeth City Hall truly is a magnificent building and has pride of place amongst a number of other historic buildings in the city centre. The city hall was originally built between 1858 and 1862, but without the clock tower. The clock tower was only added in 1883. Is it weird taking a picture of somebody taking a picture? As long as they're not taking one of you taking one of them. Or something like that. 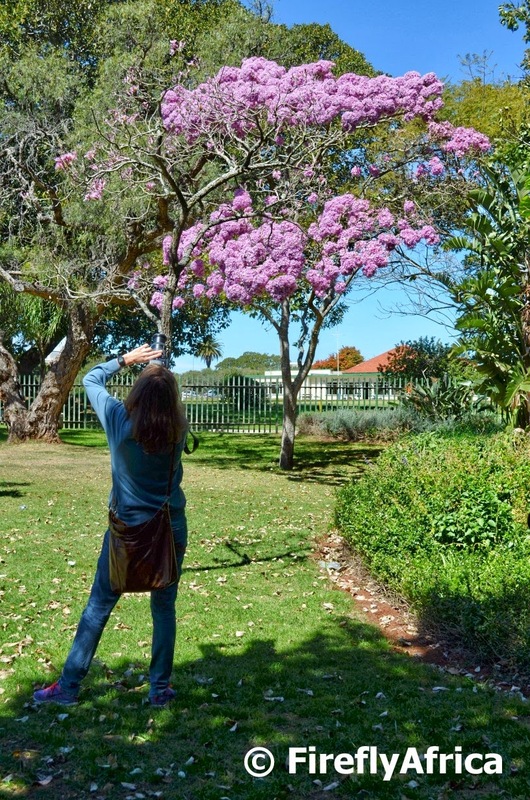 This photo is a picture of somebody taking a picture of a pink tree in St Georges Park. Even though it has an urban setting, the Swartkops Estuary with its adjacent salt pans, is one of the most important wetlands areas in South Africa. It is seen as an Important Bird Area playing host to over 10 000 water birds in summer and is one of the best places in the country to see the less common estuarine waders and terns. All in all its one of the premier birding venues in Port Elizabeth with about 200 species found there regularly. 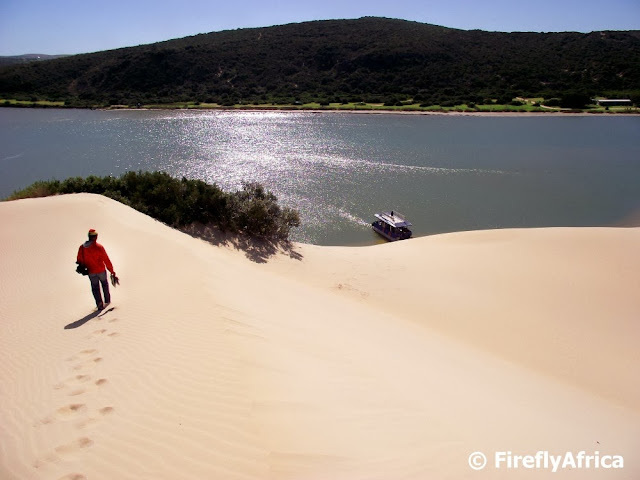 Big parts of the estuary and surroundings, specifically the dense coastal thicket vegetation on the northern escarpment, are protected by the Zwartkops and Aloe Nature Reserves. Unfortunately the estuary are constantly under threat, specifically from pollution carried in storm-water drains, mismanaged sewerage and industrial waste but at the forefront of the battle against this are the groups such as the Zwartkops Trust. Visiting the Van Stadens Wildflower Reserve I noticed that the work on the pedestrian barrier is going well. A 2.7m high barrier is being put up on the Van Stadens Bridge west of Port Elizabeth by the Friends of Van Stadens Bridge Trust in an attempt to deter suicides from the bridge. The barrier is being erected along the whole 198 m length of the bridge and will be used in conjunction with the closed circuit television to stop potential jumpers. 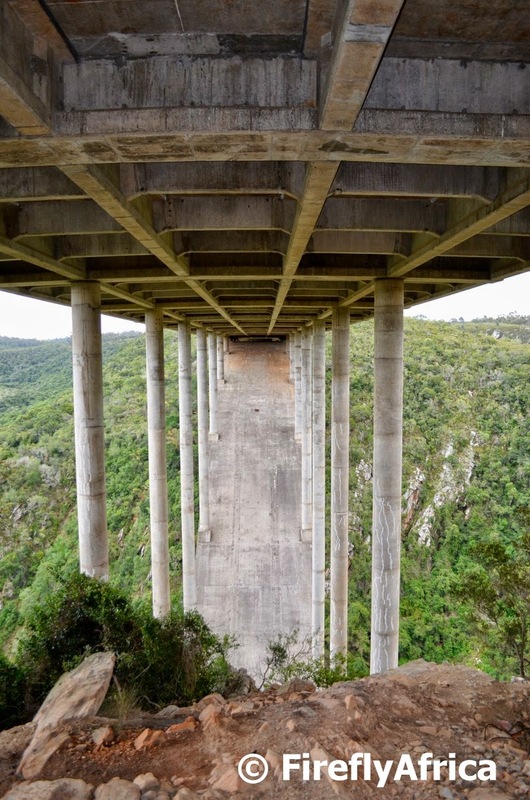 It will be made of epoxy coated, closely spaced steel mesh which is difficult, if not impossible, to climb but won't impair the view of the gorge to passing motorists. Cricket fans the world over would be familiar with St Georges Park in Port Elizabeth, the oldest test stadium in South Africa. Those same cricket fans would have watched or listened to commentary about games at the stadium and heard the commentators refer to the two ends as the Duck Pond and Park Drive Ends. These days people would think that the Duck Pond End refers to the Duck Pond Pavilion that is on that side of the field, but do they know where the pavilion and the end got its name from? Well right behind the pavilion is the duck pond which gave its name to the massive structure looming over it. There aren't ducks in it anymore but back in the days there were and one of the commentators just impromptu starting referring to that side of the field as the Duck Pond End. A name that stuck. 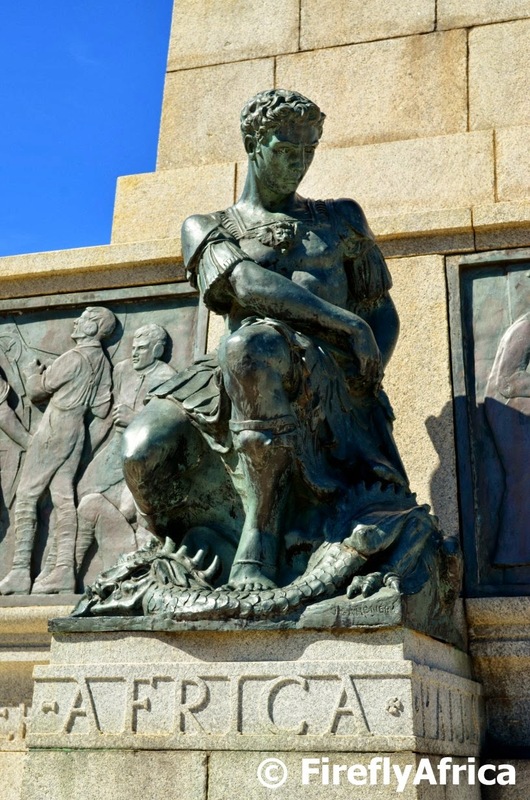 Most people who have been to or driven past St Georges Park know the Cenotaph (war memorial) in front of the Nelson Mandela Metropolitan Art Museum. I wonder though how many people know that one of the figures forming part of the Cenotaph is St George himself, sheathing his sword moments after killing the dragon. "...a dragon or crocodile makes its nest at the spring that provides water for the city of "Silene" (perhaps modern Cyrene in Libya or the city of Lydda in the Holy Land, depending on the source). Consequently, the citizens have to dislodge the dragon from its nest for a time, to collect water. To do so, each day they offer the dragon at first a sheep, and if no sheep can be found, then a maiden must go instead of the sheep. The victim is chosen by drawing lots. One day, this happens to be the princess. The monarch begs for her life to be spared, but to no avail. She is offered to the dragon, but there appears Saint George on his travels. He faces the dragon, protects himself with the sign of the Cross, slays the dragon, and rescues the princess. The citizens abandon their ancestral paganism and convert to Christianity." 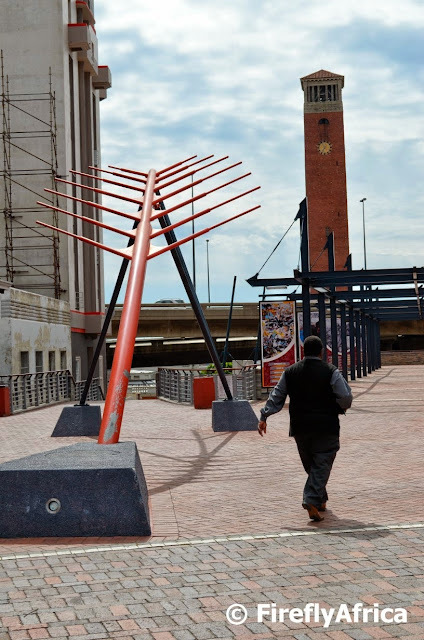 One of the weirder art pieces forming part of Route 67 is the Fishbone on Market Square. 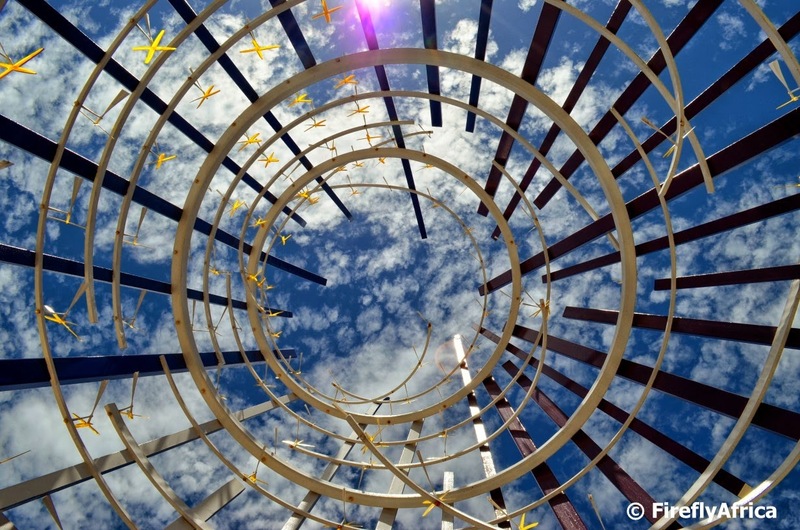 The Fishbone was designed by Imbono FJA Architects and is intended to visually anchor the old Jetty Street to Market Square and to encourage pedestrians to trace a historical path from the city to the harbour. The picture was taken from Market Square looking towards the harbour thus putting the Campanile into picture. 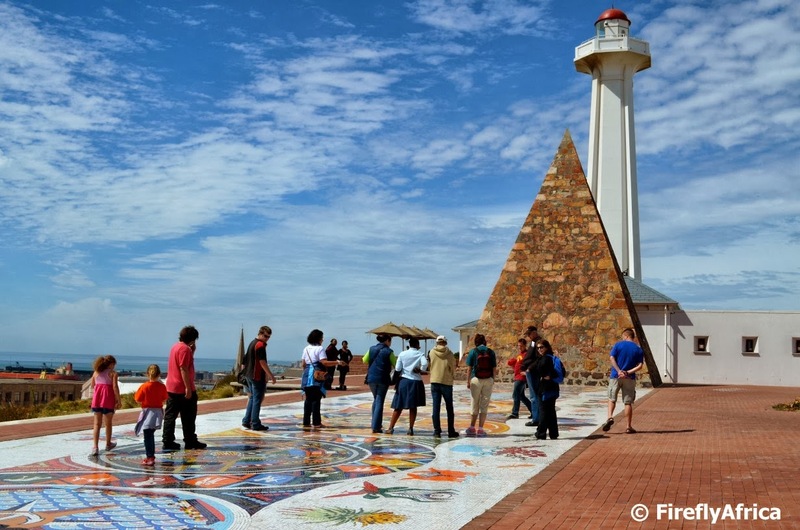 The Campanile is the official starting point of Route 67 leading up to the Donkin Reserve. I think most of the regular PE Daily Photo readers know by now that I am an addicted Geocacher. One of my own caches is situated close to a old footbridge over the narrow gauge railway line next to the South End Cemetery. 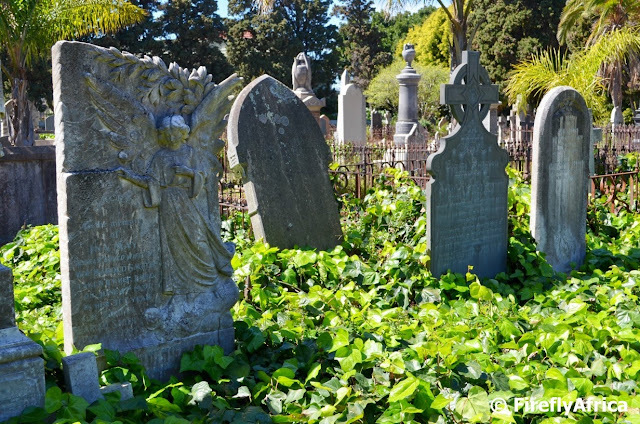 Between the cemetery and the railway line used to be a residential area with only a few remains still visible today. After publishing the cache one of my fellow cachers sent me a link containing some information on the area which used to be called Stuart Township. 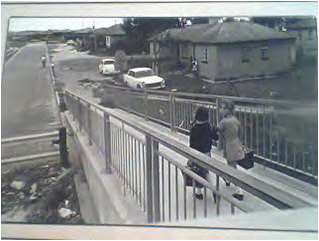 The picture above was taken from just beyond the footbridge showing what used to be Poole Street which can be seen in the old picture below. 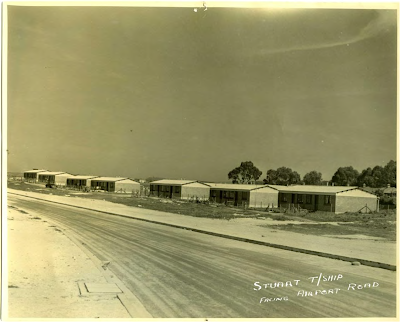 Stuart Township was established in 1938 and named after JH Stuart who became a municipal councillor in 1936. 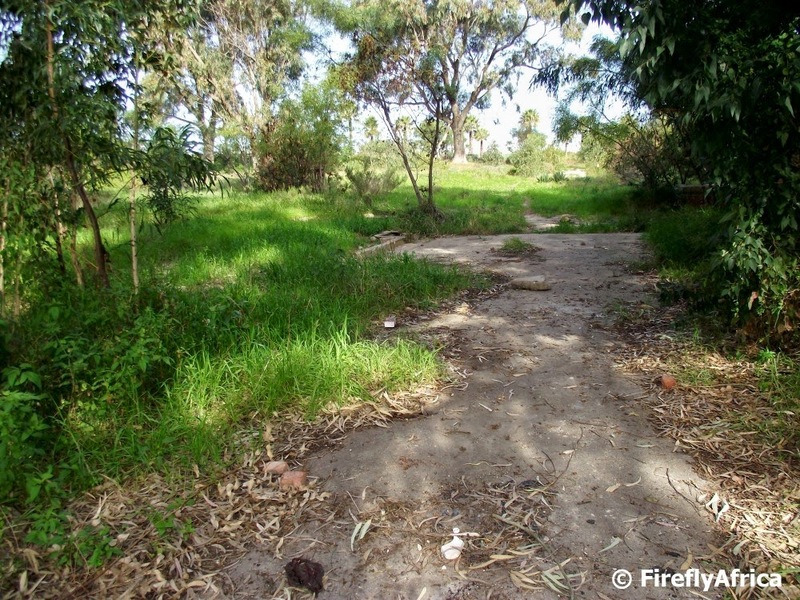 It was situated at the end of South End between the railway line and the Airport road. Two hundred semi-detached houses were built to house members of the Coloured community. In the early 1950’s Coloured communities from nearby Forest Hill were moved to houses added east of Poole Street. After the proclamation of the 1961 group areas, members of the non-white population living in South End (and other parts of the city) were moved out of the area. By the beginning of the 1970’s the Coloured community of Stuart Township were completely removed and relocated to the northern areas of Port Elizabeth and in 1972 members of white population were moved into Stuart Township. 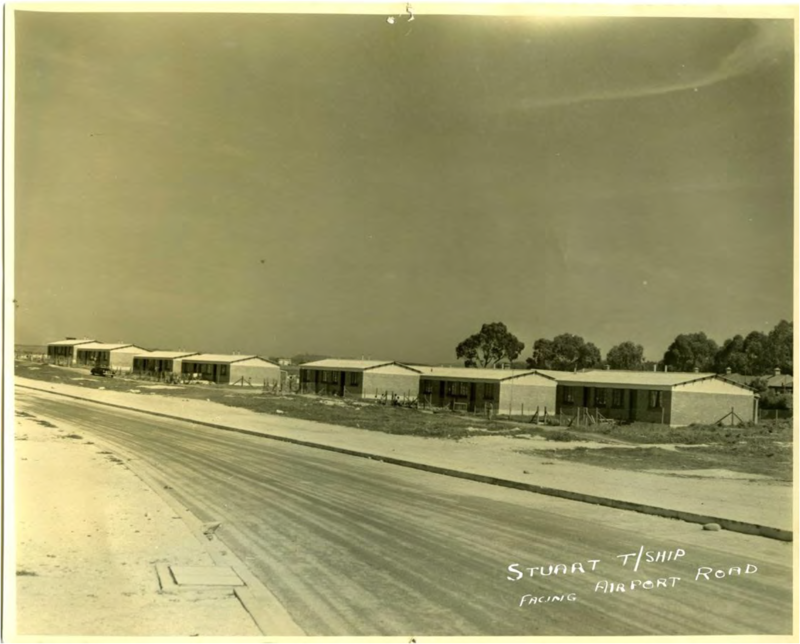 In 1979, 127 houses of Stuart Township were demolished. Unfortunately I couldn't get any more information on when people were finally moved out of Stuart Township for it all to be demolished. 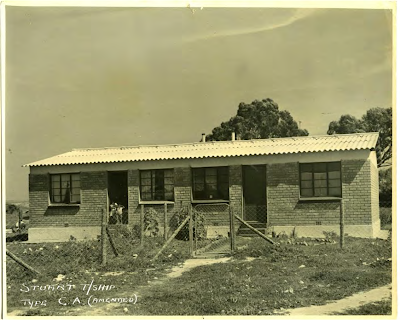 South African Heritage Resources Agency website. 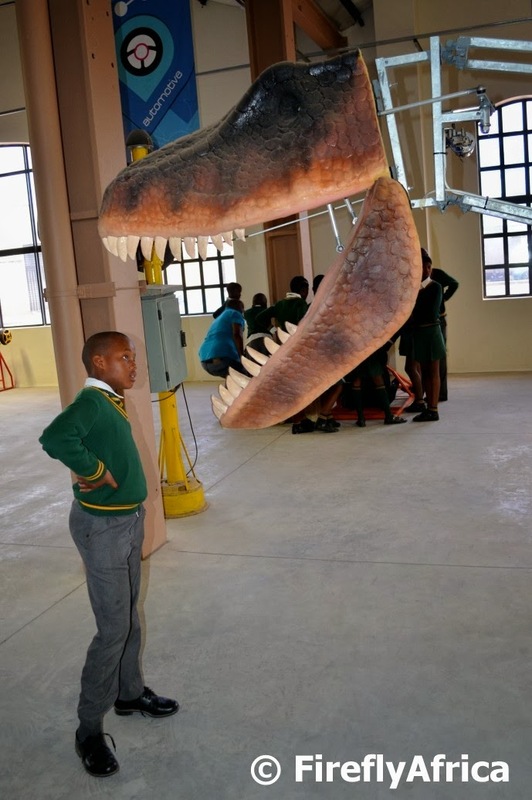 The Nelson Mandela Bay Science and Technology Centre in Uitenhage is Nelson Mandela Bay's newest "museum" and is slowly becoming a favorite with both local and visiting school groups. Taking a walk around the centre I found this boy looking at the T-Rex model with interest. While his friends were gathered around the racing simulator nearby he was looking at the mechanical workings of the model. Amazing how different people have different interests. Have aloe, will photograph. 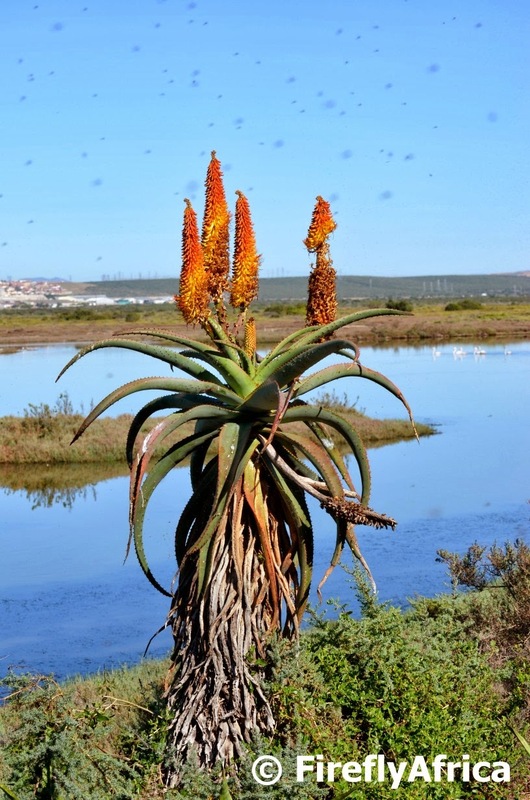 That is the case with me when I find a flowering aloe somewhere in the wild. With the aloes' flowering season something of the past I will run out of pics soon, but seeing that I still have one or two, I'm posting one today. This aloe is from the Flamingo Trail in the Zwartkops Nature Reserve and the little smudges above it isn't from a dirty lens but thousands of little muggies (midges) swarming around us at one stage. Another picture (see Old Railway Shed Roof) from my visit to the old railway sheds next to the Nelson Mandela Bay Science and Technology Centre in Uitenhage. During my last visit to the Seaview Predator Park I snapped a couple of pics of their two Hyenas and wanted to share this one with you. 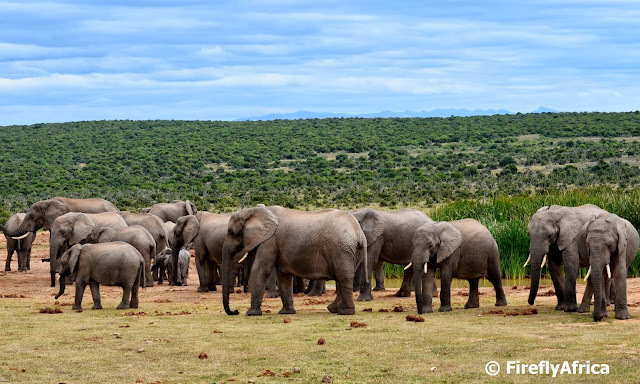 Since my visit the two, named Ed and Shenzi, has been returned to the reserve they came from as babies and word is that they are doing great and have found themselves at home with the group right away. 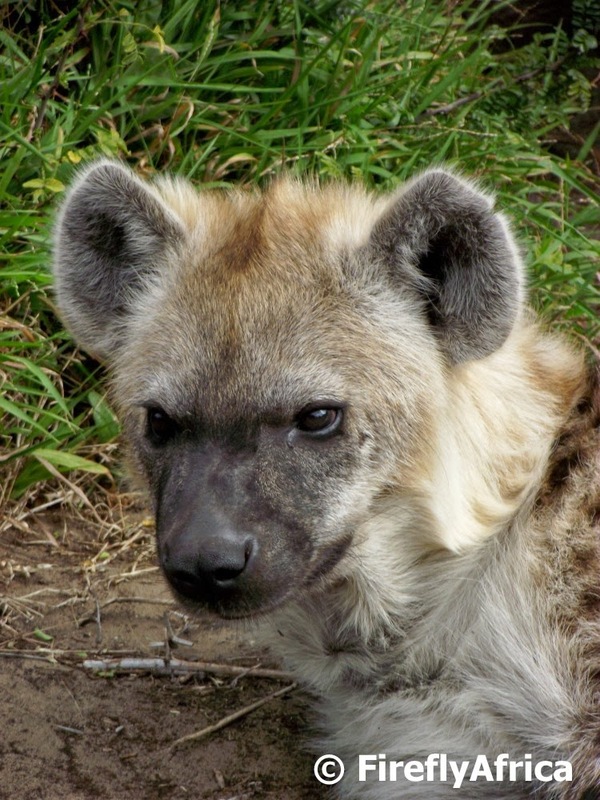 I couldn't find any other information on their website or FB on why the hyenas came to Seaview as cubs and where the reserve is, but for the sake of the post, just enjoy the picture. I just can't get enough of Route 67 and all it's art pieces. There are so many possibilities for photographers looking for interesting angles and subjects. The Voting Line is one of my favourite pieces and for some reason I've only photographed it looking towards the lighthouse and pyramid. Visiting the other day there was a group of people walking past as I was standing by the base of the flag pole and I got to snap it from a different side for a change. The Bus Station Mural by 4 Blind Mice which forms part of Route 67 is probably the one piece which I would love to have seen somewhere else. Not because I think that it doesn't fit perfectly in the bus station, but because I would love more people to see it. Its colourful and vibrant and I absolutely love it for that. 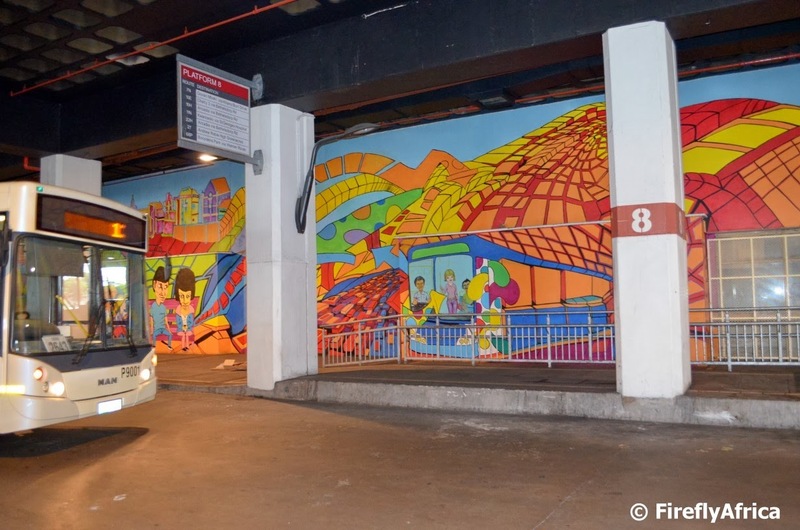 The mural celebrates public transport and the daily journeys undertaken by the people of the city. 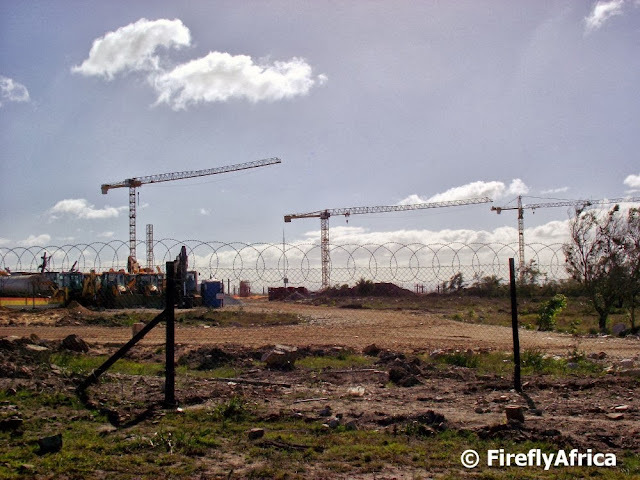 In June (2013) construction started on the Bay West Mall just west of Sherwood in Port Elizabeth. Construction on the first phase of this mega development next to the N2 is expected to be completed in 2015. The development will cover about 300 ha when finished and will be focused around a 90000m² shopping centre. 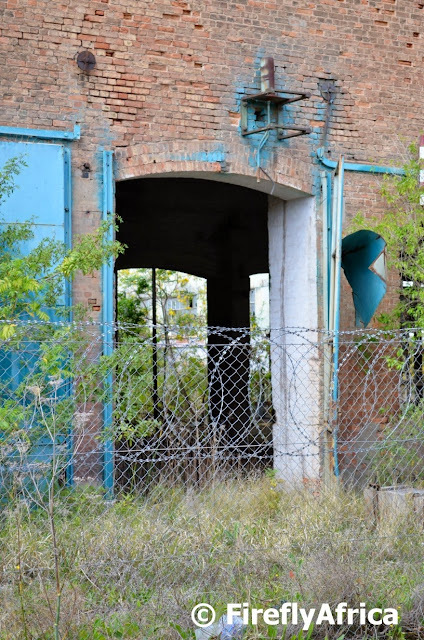 The rest of the Bay West City Precinct will be made up of commercial and residential components and the whole project is said to take place over a 15 year period. I don't quite think I would like to be a statue. Yes, people walk past you and remember you every day, tourists stop by and take pictures and you have lots of feathered company but the problem is those same feathered friends and what they leave behind when they fly off again. Passing Queen Vic in front of the Public Library the other morning there was a pigeon sitting on her crown back to front. 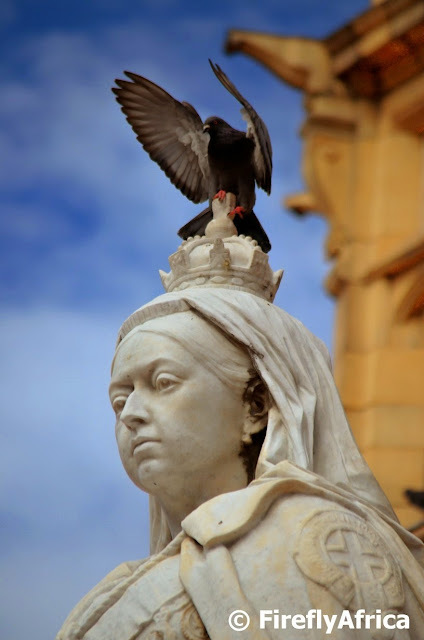 I wondered to myself what the chance would be of catching a photo of the pigeon leaving its calling card on the Queen's nose. That didn't happen but the pigeon did give me a very regal eagle pose before flying off. The statue of Queen Victoria in front of the Public Library was unveiled in 1903 to commemorate the Queen's Diamond Jubilee which took place six years earlier. The statue is made of Sicilian marble and was sculptured by E. Roscoe Mullins of London.